How do you know when your restaurant will become profitable? How do you know how much money you can safely invest? How do you know when you can start paying back investors? By projecting your startup restaurant’s return on investment. The ROI is the restaurant’s return on investment. It costs a lot of money up front to open a restaurant. Even when the restaurant begins to turn a profit it will take time to cover the cost of the initial investment. Understanding the concept of ROI helps you to practice control when planning your restaurant budget. Why Is Estimating ROI Important? By projecting your restaurant startup’s ROI break-even point you can estimate when you’ll be paid back. This also helps you decide how much money you’ll need to spend before the restaurant turns a profit. Also, knowing startup investment ROI is a vital part of your business plan. If you don't project sales and weigh them against your investments you won’t know how much profit to expect past break-even. This is important information for attracting investors. The number one determinant of whether a restaurant can keep the doors open during the startup phase can be attributed to the Income to Investment Ratio. You need to give yourself plenty of runway for your restaurant to take off. During the first few months, building up a clientele and getting to know the business is difficult. It may even take years. That means not overspending in the startup phase and running out of cash later. 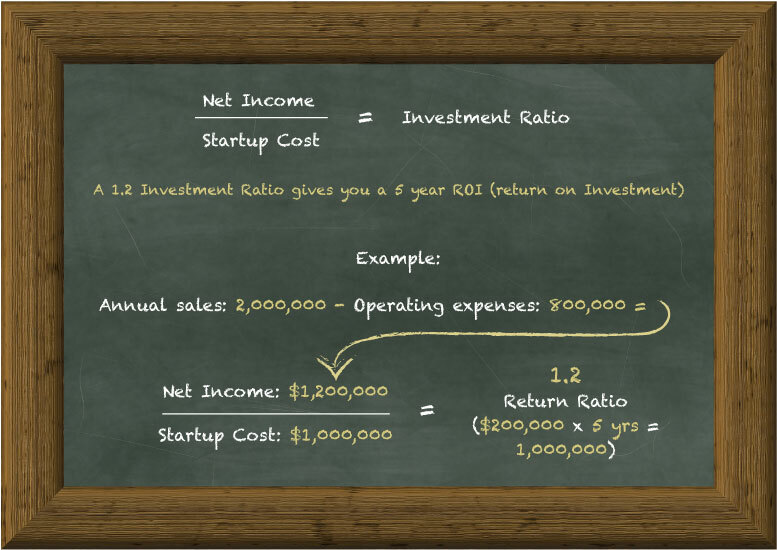 The income to investment ratio is a measurement of how fast you can expect to recoup your startup investment. The Income to Investment Ratio is not a measurement of how much money is invested; it's a measurement of the rate of return. For example, it could be an investment of $200,000 or $2 million, if the ratio is the same, both investments will take the same amount of time to pay back. What is being measured is the expected sales volume relative to initial startup cost. When deciding how much to invest in a restaurant, it's important to project sales as accurately as possible. To learn about projecting restaurant sales read our free guide. After analyzing the success and failures of many restaurants a rule of thumb has been established for the industry. A restaurant business opportunity should be able to pay back your initial investment within the first five years or less. If your projections show that it will take longer than five years to break even, you are making a risky investment. Estimating your startup restaurant sales for five years is already a difficult projection to make. Who knows what will change in the world around us over the next five years? This means that an ROI longer than five years becomes more of a gamble. That can be very risky to your personal and financial future. A higher ratio means reaching the ROI break even point sooner. For example, a 1.6 income to investment ratio sees your money back in about half the time as a 1.2 rate of return—only two and a half years. Remember, that’s just a projection. It's always going to cost more than you think to start a restaurant. Be conservative with your sales projections and overestimate your costs. The ultimate decision maker is you, and how much risk you are willing to take. Another way to understand the income to investment ratio is to say that income is, in this example 1.2 times the initial investment. If costs and sales remain constant, it will take five years to recoup the initial million dollar startup cost and begin turning a profit. If there is one thing the established franchises know how to do, it's reduce financial risk and establish comfortable profits. They may spend three million to open a new location, but they make sure that the ROI is fast. Projected income in the first year may be 6 million, a ratio of 2 times the initial investment, reaching the ROI break-even the first year in business. A big part of their model is to scout for specific locations that have the greatest potential to give the highest rate of return. When you follow the methodology presented in this guide you have the same tool they use to find restaurant opportunities that offer fast and profitable returns with reduced risk. Hopefully after reading this guide you're convinced how important it is not to over-extend your finances when starting a restaurant. Find business opportunities that begin to return on your investment sooner: five years or less. The key to identifying a goldmine restaurant opportunity is projecting costs accurately, estimating sales conservatively, and performing diligent market research. Continue reading the free guides in this startup restaurant tops series, provided by Rezku, by visiting our resource library. Learn more about Rezku by visiting our homepage. Get a free restaurant management technology consultation with an expert today and get all your questions answered.